Painted cycle lanes providing no actual physical protection for people on bikes, but are often also too narrow to be of any benefit. In some cases, narrow cycle lanes can actually put people using them in more danger, as they can encourage people driving to pass too closely when staying within the directed lanes. The very minimum width directed by the roads design guide of a painted cycle lane is 1.5 meters, and the recommended width is 2 meters. The highways code’s minimal passing distance for anyone overtaking a bicycle has recently be legally formalised to 1.5 meters. Morrison Street has a narrow unprotected cycle lane painted in the middle of three lanes of busy traffic, where passing distances, as a result of the road layout, are regularly too close. 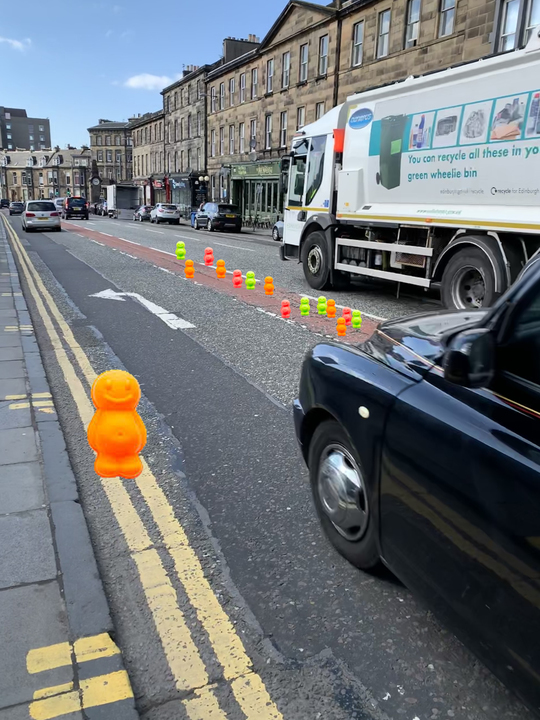 I am inviting people to nominate cycle lanes that they want measured in jelly babies during POP weekend in the Edinburgh area (I may go further afield time permitting). The offer is to measure the width of the cycle lane in jelly babies laid out head to toe where safety permits. People will be able to guess the number of Jelly Babies they think the lane is wide and this can be benchmarked against the minimum passing distance of 1.5 meters (that’s a grand total of 50 jelly babies). If anyone wishes to join me on this quest they are free to do so. My own nomination is the cycle lane on Morrison Street between 3 lanes of motor traffic. DM me on twitter ( @thebonnieloon ) if you have other location suggestions.